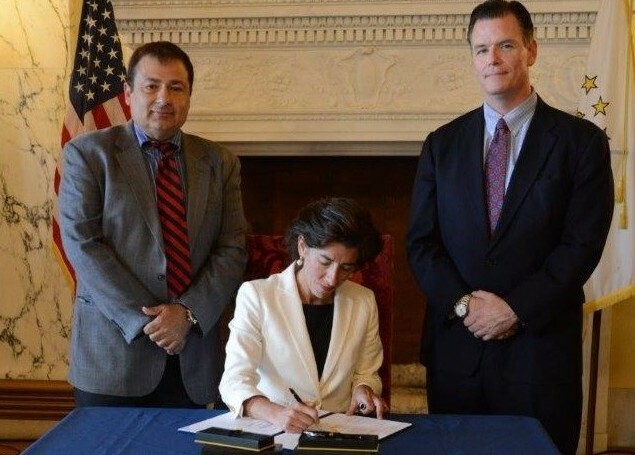 STATE HOUSE – Legislation (2016-H 7259 / 2016-S 2401) sponsored by Rep. K. Joseph Shekarchi and Sen. Stephen R. Archambault that requires training for law enforcement officers on mental health and substance abuse emergencies was signed into law today by Governor Raimondo at a ceremonial bill signing at the State House. The legislation requires the Commission on Standards and Training to provide training and instructions for police officers and trainees in order to more accurately identify complaints involving mental health or substance abuse emergencies and to develop law enforcement responses to such emergencies. The bill also contains language that calls for the creation of a course of instruction that complies with the certified National Council of Behavioral Health Mental Health First Aid Program. The course is designed to provide information to law enforcement officers to recognize the signs and symptoms of common mental illnesses and substance use disorders, de-escalate crisis situations safely and initiate timely referral to mental health and substance abuse resources available in the community. For an electronic version of this and all press releases published by the Legislative Press and Public Information Bureau, please visit our website at http://www.rilin.state.ri.us/News.